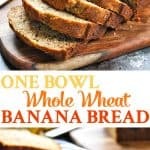 This One Bowl Whole Wheat Banana Bread is an easy and healthy breakfast or snack that comes together in about 10 minutes! My friend Kristin makes the best banana bread. So when I recently had some over-ripe bananas sitting on my counter, I begged her for her recipe and she graciously shared. Since I can’t leave well enough alone, I tweaked Kristin’s recipe to make a healthier version. 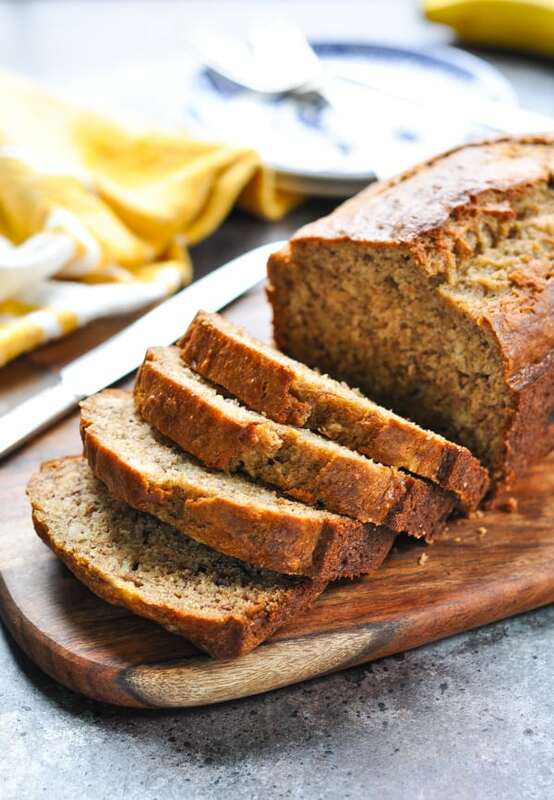 This low calorie One Bowl Whole Wheat Banana Bread comes together in about 10 minutes with just a handful of basic pantry staples! This recipe was originally published in July, 2013. The photos were updated in August, 2018. 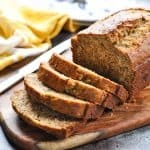 I’ve tried a lot of “healthy” or “whole wheat” banana bread recipes over the years, but they always seem to come out dry, too dense, or lacking in flavor. 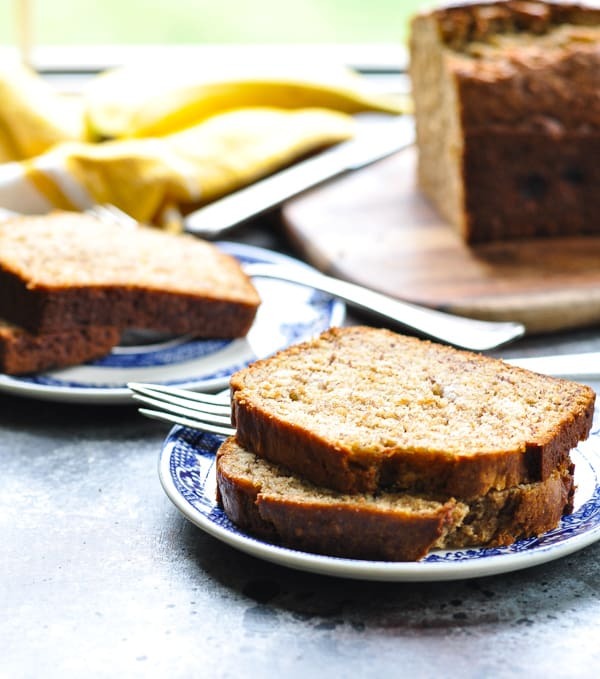 I call this recipe The Perfect One Bowl Whole Wheat Banana Bread because it’s…perfect! 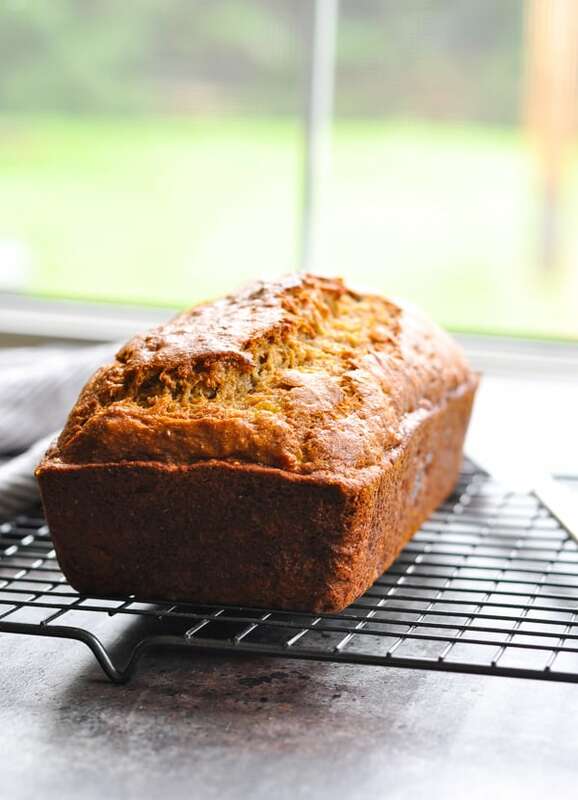 Every mom needs a staple go-to easy banana bread recipe that she can turn to whenever she has overripe bananas sitting on the counter. This particular recipe is simple, it’s kid-approved, and it yields a perfectly moist loaf of bread every single time. Plus, you can’t beat the easy cleanup with just one bowl! 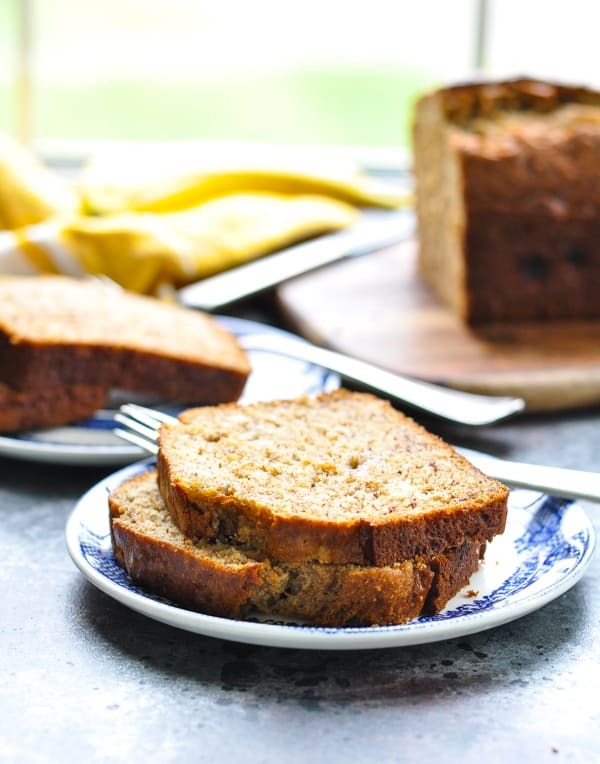 How to Make Banana Bread Healthy (and Still Delicious)! Sure, you could swap out all of the white flour for whole wheat flour, omit sugar, and use only pureed fruit in lieu of fat in the recipe. But you know what? It probably won’t taste very good! Substitute whole wheat flour for half of the all-purpose flour. The combination of flours gives you the benefits of the whole grains, but prevents the loaf from turning into a dense, dry brick that you might get from 100% whole wheat. Decrease the amount of refined sugar to just 1/2 cup for the entire loaf. The rest of the sweetness comes from the natural sugars in the fruit. Use just a tiny bit of butter for flavor and fat, but otherwise use the fruit purees for moisture. This can be tricky! If a recipe calls for 3 bananas, how much is that? We all know that measurements are important in baking, so the difference between a very small banana and a very large banana can be significant when baking a loaf of banana bread. My recipe calls for 3-4 mashed bananas. One large banana yields about 1/2 cup mashed, so I used 3 large bananas for a total of about 1 1/2 cups. If you’re working with small bananas, you’ll need at least 4 (and maybe even 5). 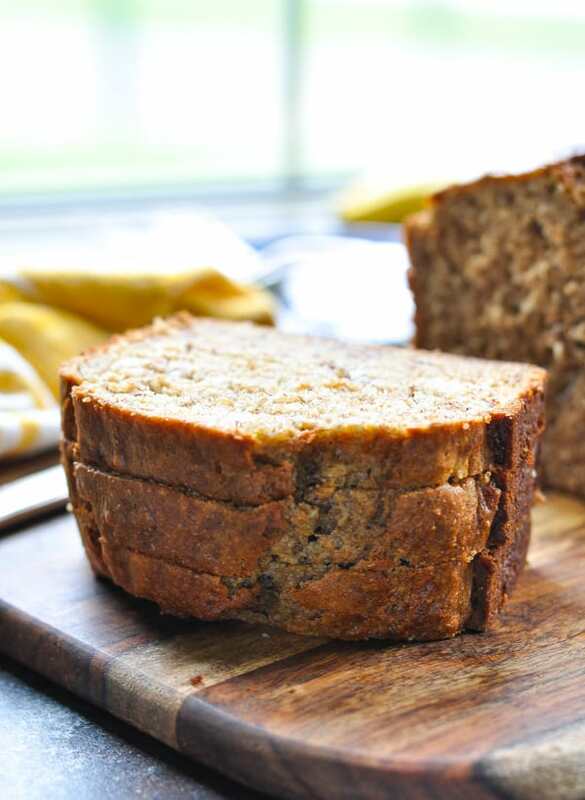 Measuring is always the safest way to make sure that your banana bread turns out perfectly moist, sweet and delicious! Stir in some mix-in’s! My boys love miniature chocolate chips stirred into the batter. Fresh (or frozen) blueberries are also a nice addition (just like I used in these Whole Wheat Banana Blueberry Muffins). There’s no need to measure the add-in’s: just toss in a handful or two, to taste! Bake the batter in mini loaf pans! 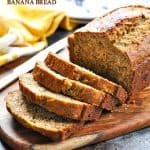 You can easily freeze the extra loaves of banana bread for a later time. With mini loaf pans like these, your banana bread will bake at 350 degrees F for about 30 minutes. Add some spices! I love to stir in about 1 teaspoon of cinnamon, but a dash of nutmeg would also be a delicious addition. Feel free to enjoy this delicious treat for breakfast or for snack – guilt free. It’s a low-calorie option that satisfies your sweet tooth and makes the little ones very happy! It maintains all of the great flavors and textures from Kristin’s original recipe, but with a healthier profile. Basically, this is the best of both worlds! 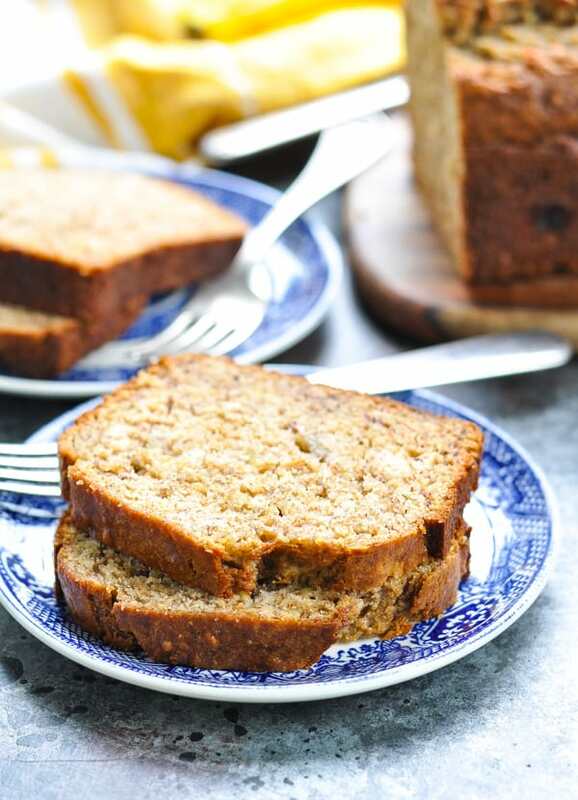 If you’ve tried this Whole Wheat Banana Bread or any other recipe on The Seasoned Mom, then don’t forget to rate the recipe and leave me a comment below! You can follow me on Facebook, on Instagram, on Pinterest, and on Twitter! Preheat oven to 350 degrees F. Spray an 8.5-inch by 4.5-inch loaf pan with cooking spray and set aside. Place mashed bananas, melted butter, and applesauce in a large bowl. Use a wooden spoon to mix together. Add sugar, egg, and vanilla to banana mixture. Stir until well blended. Pour batter into prepared loaf pan. Bake for 35-55 minutes, or until brown and toothpick inserted in center comes out clean. Be careful not to over-bake your loaf, so check it early on. Mine usually only takes about 45 minutes to cook. This looks really good! I’ll be baking it next week for kids’ snack for sure. Wonderful! Enjoy, Mila! 🙂 I might be baking another loaf next week, too! I made the banana bread today— excellent! I really wanted a banana bread that would be a healthy and delicious snack, not a dessert. I didn’t have applesauce so I used Greek yogurt instead. I added unsweetened shredded coconut for texture. So good! Awesome! So glad that it was a hit! It’s definitely one of our favorites, and I’m glad to know that the Greek yogurt works too. The coconut sounds delicious! Delicious and tasty. Thanks for sharing. I made it yesterday. I didn’t have applesauce. Instead in this apple harvest season I cooked a freshly picked apple together with some cinnamon and water and made my own apple purée. Yummy! This recipe was fantastic!! I did not have applesauce on hand, but thanks to suggestion of another, I was able to make my own with fresh apples I had on hand! Added fresh frozen blueberries and nuts…so delicious!! Thanks for sharing! That’s wonderful, Susan! I’m so glad that you enjoyed it! I just had a slice with peanut butter on it for breakfast this morning! 🙂 Truly a staple in our house! This was great i made it with brown sugar and a teaspoon of cinnamon. Can you use all whole wheat flour?